John Burton founded J R Burton Contractors in 1973 with three employees, an old backhoe and a grader. 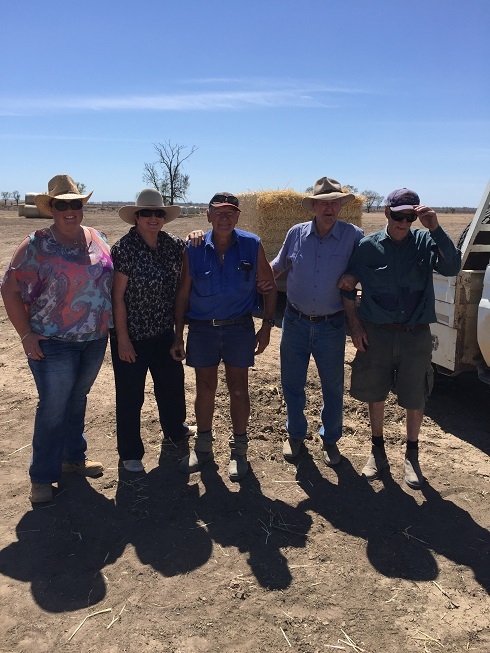 3 days before Christmas Amy Bromhead, Community Relations Liaison of Kelso, had the pleasure of going to Lightning Ridge to witness the distribution of the hay purchased with the funds that had kindly been donated through the fundraising site. $14,000 was raised in total. Amy stated: "It was so fantastic to be able to get up there to meet everyone that I have been liaising with over the past 8 months, but at the same time it was so sad to see the area so dry. I could not get over the dust and complete lack of ground cover." Amy was flown to Lightning Ridge by the very generous Graham Burke, the owner of Burke's Transport in Bathurst. Graham has his own Piper 6 seater plane and they flew out from Bathurst Airport at 4am. Landing at Lightning Ridge Airport 2 hours later, exactly at sunrise. Through the generosity of a local resident, they were chauffeured from the airport to Doug Wilson's farm. The hay had already been trucked to Doug's farm, where Doug had kindly donated his time, tractor and farm as a distribution centre for the hay. A BBQ was started up and the surrounding farmers started arriving soon after. Amy stated: "Sadly, you could see the farmers coming from a couple of kilometres away because of the dust cloud that each vehicle created. Despite the awful conditions, I have never met such a resilient bunch of people in all my life. All of the farmers I met were so unbelievably friendly and welcoming. The stories they shared with me over a breakfast sandwich were heartbreaking but so inspirational. It certainly put all of my issues into perspective." Every farmer asked to pass on their heart-felt appreciation for the hay that has been donated to them through this fundraiser. They were astounded when Amy rattled off the names and locations of each donor, struggling to accept that the love and support is coming from all directions, and all walks of life. Burton Contractors would like to thank everyone who donated to the fundraiser. Your money has gone directly into bales of hay that went straight on to the back of these struggling farmer's utes, trucks and trailers. We would also like to thank Graham Burke and Amy Bromhead for their hard work and drive in making this happen.